The AWF: Bringing Real Wrestling Back, Four Minutes at a Time - WrestleCrap - The Very Worst of Pro Wrestling! Check out Art0Donnell’s Facebook Page Here! The landscape of mainstream pro wrestling was indeed bleak in 1995. In the WWF, a shallow talent pool led Vince to crown Mabel (MABEL!!!) as the King of the Ring, let Diesel run live attendance into the ground as WWF champion, and put wrestling hog farmers, pirates, race car drivers, and dentists on pay-per-view. In WCW things weren’t much better, as Hulk Hogan and his many washed-up friends dominated television and held back younger talent. Both major promotions pushed a cartoonish, family-friendly product out of touch with the interests of its fan base. Fortunately, there was an alternative for those fans who craved cutting-edge angles, intense action, and new stars. That promotion was none other than… ECW. But for those fans whose gripes about WCW and WWF included matches that flowed too well, high production values, young talent, and a lack of victories awarded by referee’s decision, then there was yet another alternative: the American Wrestling Federation. The AWF Warriors of Wrestling arrived on syndicated television in 1995, sporting a who’s who of well-past-their-prime superstars. Sound like WCW? Because WCW didn’t have a revolutionary ROUNDS system! 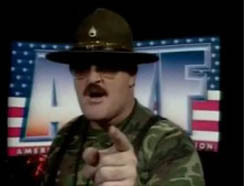 The AWF TV intro was something to behold, featuring Tito Santana, Hercules Hernandez, Koko B. Ware, Chris Adams, The Warlord, and Mr. Hughes, and a spry 47-year old Sgt. Slaughter. How did such a roster get a TV deal? Perhaps these old favorites (and Mr. Hughes) still had some drawing power. Perhaps people were longing to see the continued antics of Frankie the bird. Or perhaps it had something to do with promoter Paul Alperstein paying TV stations around the country to air his program. Call us jerks, but our money’s on the latter. One important diffence between Gazelle hawker Tony Little and the AWF: the wreslting company wasn’t actually selling anything. There were few house shows. TV tapings were free to attend and allegedly featured free food to attract the local homeless. There was a rumored pay-per-view, but that never materialized. Not sure we follow that particular business model. 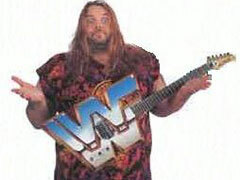 So what did the AWF(ul) have going for it, besides aged stars of yesteryear? 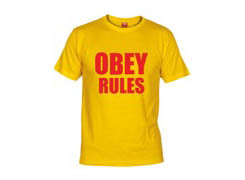 Throughout the show’s debut episode, the announcers lauded the strict enforcement of the rules (such as a ban on throwing wrestlers over the top rope) by the officials. 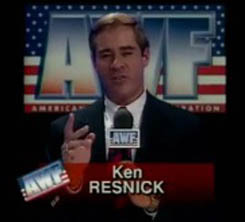 What truly made AWF stand out was its revolutionary concept, an idea that would change the face of wrestling forever and make the Fed “the most unique and innovative wrestling promotion in the world today.” This concept was a rounds system, in which each match was divided up into three 4-minute rounds, with a 1-minute rest period in between rounds. And if there was no fall scored in those twelve minutes of action? The match would be decided by the referee and two judges! Finally, wrestling fans’ dreams could come true. Everyone praises “classic” matches like, say, Steamboat vs. Savage, but imagine how much better that match would be if the wrestlers were forced to go to their corners every four minutes, or if Steamboat had been disqualified for choking the Macho Man a minute into the match. I still get goosebumps thinking about how great a torch-passing moment Wrestlemania VI would have been if, after twelve minutes of grueling action, Earl Hebner, Jack Tunney, and Pat Patterson awarded Hulk Hogan’s title to the Ultimate Warrior after a long and dramatic comparison of scorecards. All joking aside, the sacrifice of certain entertaining aspects of pro wrestling and the adoption of certain formalities and regulations were vital if the AWF wished to bring back an air of respectability, realism, and sportsmanship to an exhibition in which two grown men pretend to beat each other up. A viewing of AWF’s first episode should give you a picture of how utterly radical and earth-shattering the federation was. The announcers for AWF Warriors of Wrestling were Mick Karch and WWF gimmick casualty Terry Taylor, and on later episodes, Lord Alfred Hayes. On this first episode, Terry excitedly announces the day’s card, including squashes featuring Tito Santana, “America’s Hero” Sgt. Slaughter, Tony Atlas, Greg “The Hammer” Valentine,” and Koko B. Ware. Not a bad card for 1986. Except this was 1994, so it was a bad card. 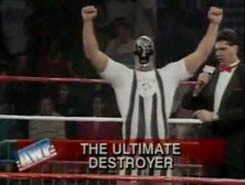 As embarrassing as the main roster might sound, it’s their opponents who really shout “bush league.” Take Tito’s opponent, who is dressed in a referee-striped singlet and a silver mask; his moniker is “The Ultimate Destroyer,” possibly the result of a random name generator. Despite no one ever having heard of him or seen him wrestle, though, the papered audience boos him lustily, almost as if they were being prompted to do so. That couldn’t be, could it? “Is there a more popular star in wrestling that Tito Santana?” asks Karch. I suppose an answer like, “Why yes, of course, there’s Hulk Hogan, Bret Hart, Sting, Diesel, Shawn Michaels, Randy Savage, Razor Ramon, The Undertaker, and there’s a goofball promotion in Indianapolis that claims Mike Samples is the world’s most popular wrestler, I’ll count that too” would have been too wordy. The audience squeals in ecstasy as Tito escapes an Ultimate Destroyer hold; it must be the fans on the other side of the camera doing the screaming, since the ones shown on TV appear to be sitting quietly. Sure enough, there are occasionally shots of super-excited fans making repetitive gestures despite the armbar that Tito has been applying for the past thirty seconds. Perhaps these same people listed the AWF on their résumés when applying to be extras on Exposed! 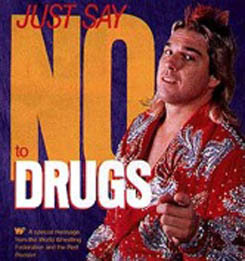 Pro Wrestling’s Greatest Secrets. When Terry Taylor hypes up a rest period, whatever dignity he had left after the Red Rooster gimmick gets beheaded like a chicken and is now running blind around the barnyard. The announcers even contradict themselves in the very first match, commenting that Ultimate Destroyer is “throwing that rulebook out the window completely” by raking Santana’s face. What happened to the strict enforcement of the rules that the fans love so much? After Tito wins his squash match (which, after the post-production sound effects, sounds like Hogan-Andre at the Silverdome), the former Matador gets interviewed by Ken Resnick, the old AWA announcer perhaps best known today as the host of the Wrestlerock Rumble music video. Tito explains that the rounds system favors people who are in great shape. How exactly a rest period every four minutes requires peak physical conditioning is never quite explained. 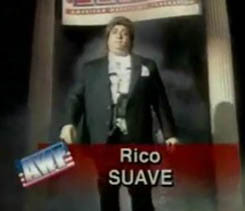 Up next is Greg Valentine, accompanied by his new manager, Rico Suave, who looks to have put on a LOT of weight (and picked up a job as a used car sales man) since we last saw him. The planted fans give frantic thumbs down. They must have hated that song as much as I did. The Hammer looks to be in about as good a shape as he’ll ever be; he had not yet reached petrified cigar store indian status yet. 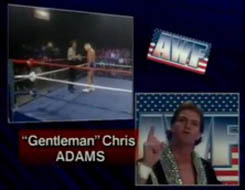 Meanwhile, Chris Adams comes on screen to explain once again how great it is to have rounds in wrestling, just like in England. I bet if Davey Boy Smith weren’t wrestling for WWF, and WCW didn’t sign him, and he didn’t want to go to Japan, ECW, USWA, or Smoky Mountain Wrestling, and he didn’t have any money saved up, the AWF would be his home away from home. Valentine wins in the first round, depriving the fans of an exciting rest period. No wonder the fans boo him so much. 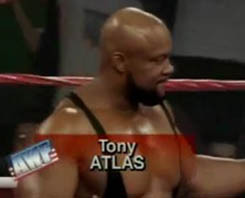 The former Saba Simba, Tony Atlas, is up next to face Sonny Rogers. “Everything on Tony Atlas is big,” says Terry Taylor. Do I even want to know what he may be referring to? The answer is NO, no I don’t. Referee Jesse Hernandez, who would use this stint in the AWF to springboard to officiating in WOW: Women of Wrestling, lets Tony Atlas get away with a choke toss. The announcers explain the referee’s weight issues by claiming that the AWF needs referees big enough to enforce the rules. So rounds system and fat referees are the order of the day here, got it. We then see the AWF’s innovative turnbuckle cam come into play, giving us all a highly distorted view of the action (while also showing the only two sides of the arena that are filled). 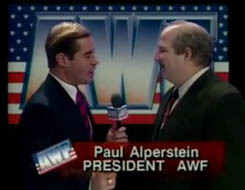 President Paul Alperstein explains that the AWF will be touring arenas around the country and around the world. Come to think of it, a show on the moon would not be out of the question either; the low gravity would be easy on the veteran wrestlers’ knees, and the paid attendance would be about the same as a regular AWF show. 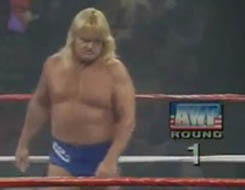 Nailz, former WWF “superstar,” squares off against Rick Thunder in the next match. 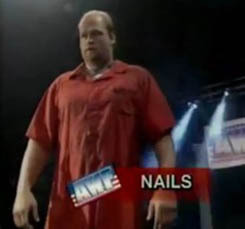 Nailz had wrestled briefly in WCW as “The Prisoner” until WWF sued for copyright infringement. How Jerry McDevitt let that slide we will never know. “Nails” chokes his opponent the entire match, stopping only to slam him against the guard rail and expose the fact that the other half of the arena is completely empty. He even tosses a stool at him and uses a chair before he is DQ’ed. The fans go wild at seeing the first of hopefully many disqualifications in the AWF. Finally, Koko B. Ware wrestles in his High Energy gear to beat Bobby Bradley in the main event to end this show. I’d add more but really, you probably get this by now. 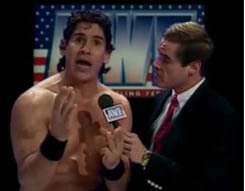 The AWF would last an impressive 30 episodes, spanning 2 years, in which time Tito Santana (the most popular star in wrestling!!!) would win the AWF Championship. The good times would not last for Tito, though, as he would be defeated by another young stud by the name of Bob Orton, Jr. Soon afterward, the American Wrestling Federation would hold its last taping. No word yet as to whether the AWF will ever make a comeback, but somewhere out there, there are loyal fans holding out hope that this sixteen-year hiatus for the federation is merely a rest period. And that’s way more exciting than you’d think. 12 Responses to "The AWF: Bringing Real Wrestling Back, Four Minutes at a Time"
Needlessly complicated rule system, old wrestlers being pushed, Terry Taylor. So this is basically a prototype of TNA! So we’re three years on from this comment, and guess what TNA just announced? If you said “a round system”, pat yourself on the back. Then hang your head in shame like the rest of us. Even better is where the belt came from. I myself suffered through watching a 4-disc, 18 episode set of this company… It sucked. It also aired on the MSG Network back in the day, which is the only positive I have for it. This write-up had me laughing out loud haha, great work-there not enough info on the net about the AWF. 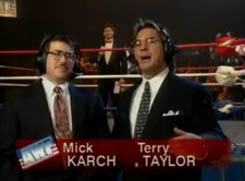 Upon watching the 3 episodes on YouTube, I’ve noticed that Mick Kartch Kinda sounds like Mauro Ranallo. The worst part of AWF was their mockery of British wrestling, which if you played the Total Extreme Wrestling series, you know the round system is big there. So, they paid to get on TV. They ran only a few house shows. They didn’t charge to attend their TV tapings and gave away free food. They never put on a PPV. And, the content they gave away for free was so bad that you still felt overcharged. I think I see why they didn’t last very long.